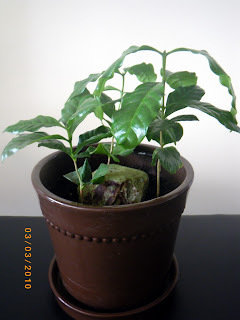 Growing Coffee Arabica plants indoor is easy, but do you have the patience to wait 3-4 years until will harvest yor first beans from your own coffee plant? 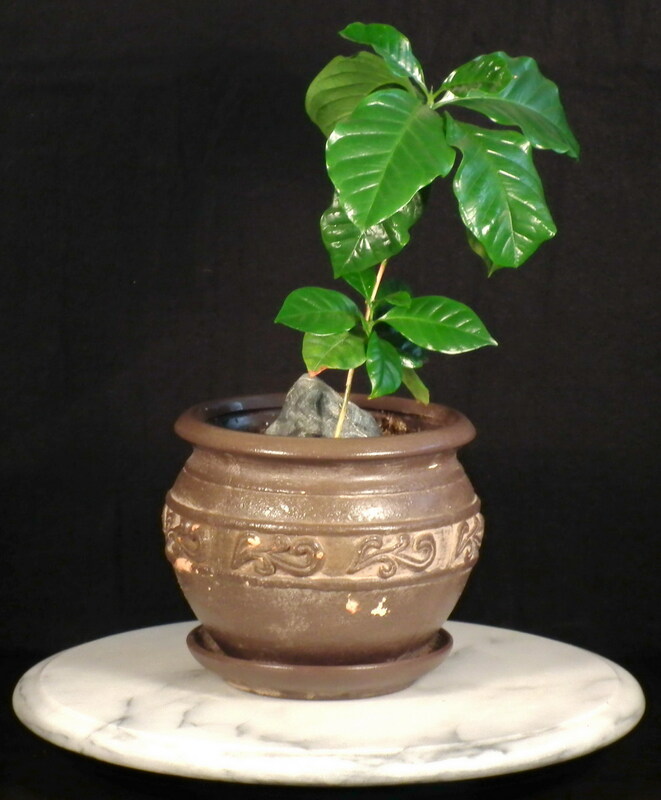 The botanical name is "Coffea Arabica", other names used being "coffee shrub of Arabia", "mountain coffee" or "arabica coffee" and is one of the 90 members of Coffea genus from Rubiaceae Family, originally to the Arabian Peninsula, Ethiopia and Sudan. Is said that they are vigorous growers (almost 1.5m high) but based on my experience, after one year, my coffee plants have only 40 cm high. They are very ornamental plants and may live on for 60 years. I'm enjoying their glossy, wavy at the edges, dark green leaves. 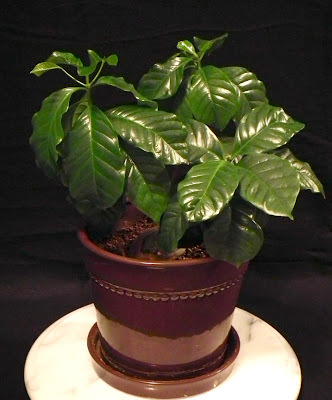 I keep them in bright light, no direct sun, on the shelf next to my books, because the coffee "tree" is actually a variety of tropical evergreen shrub. The room temperature is somewhere between 20-23°C. I planted them in Miracle-Gro Potting-Mix with some Turface MVP (soil conditioner), to provide a good drainage. Coffee plants produce white star-shaped flowers, with sweet scent similar with jasmine smell, but only after 3 or 4 years. 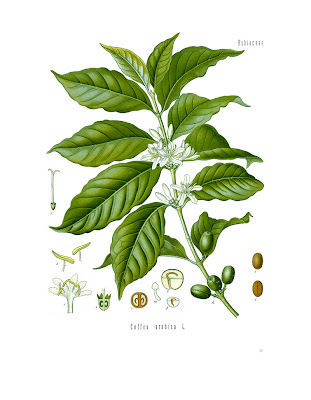 Coffea Arabica flowers are followed by green fruits, each having 2 seeds inside, which are turning the colour to red, then almost black when ripped ("cherries" are ready for picking in few months). I fertilized them only once a month with an all purpose fertilizer (10-10-10). Also I misted occasionally with warm water and I cleaned the leaves gentle with a damp cloth to avoid leaf staining. My plants were propagated from seeds, and was very fragile. I re-potted them in nice ceramic pots in March and I tried to train few of them as a bonsai, but I lost some because were snapped when I wired them. 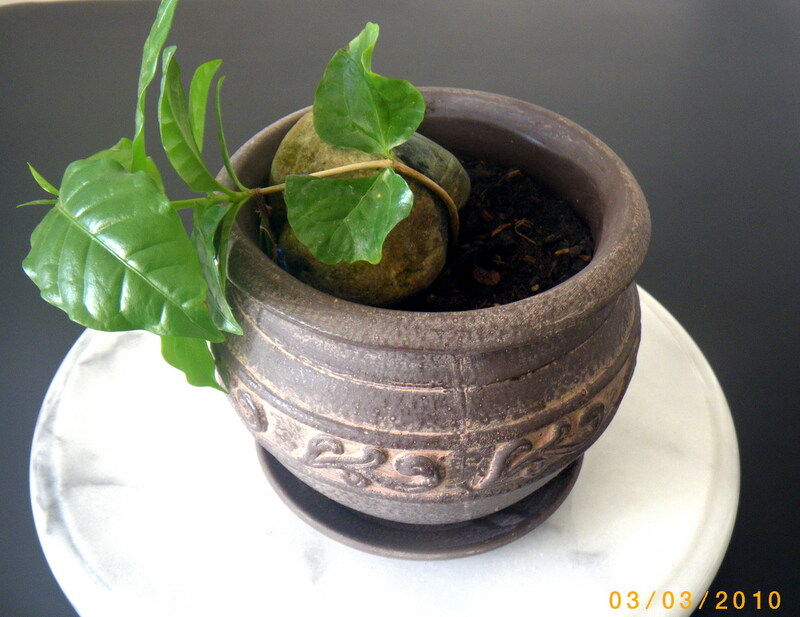 I keep one plant wired for a month, carefully bending the trunk over one rock, but I removed the wire too early and the plant returned to its original position very quickly. wow! I wouldn't have thought you could do that. I would so love to grow my own coffe plants. Except for the fact that they would never grow to maturity, since my cats will eat everything that's even remotely plant like. Happy Friday! I'm your newest follower, hope you can stop by for a visit! I've given this a passing thought. I would LOVE to be able to grow my own beans. How many cups of coffee will a tree produce each year? I'm assuming I need a BUNCH of them. That is very cool. I'm currently trying to grow a pineapple plant and avocado. I'm your newest follower. Thanks for Buzzing by my blog for Following Friday! Returning the love!